Open play for all! Spinning, swinging and seesawing!
. The equipment installation is made possible thanks do a $75,000 donation from the Thunderbird Telecom Pioneers, a nonprofit charitable organization that was organized in 1978 as the Oklahoma City Telephone Pioneer Council. Members and their families will be in attendance as well as children from the Children’s Center Rehabilitation Hospital and Special Care. Officiating the “big reveal” will be Maureen Heffernan, executive director of Myriad Gardens. The Myriad Gardens underwent an extension renovation as a part of Project180 and Devon Energy’s new headquarters. Included in that renovation was a designated play area for children that balances active play with natural learning. Today the Children’s Garden has received more than a million visits since and is much loved by families of Oklahoma City, Oklahoma and across the country. The AbilityWhirl has changed public open spaces by making merry-go-rounds accessible to children of all abilities, and this equipment is now used in hundreds of play areas, schools, hospices and hospitals. The manufacturer GL Jones is located in the United Kingdom. There are currently more than a dozen in the United States with the AbilityWhirls. The Myriad Gardens is the only one in Oklahoma. The We-saw™ is a new take on the traditional seesaw. Its unique design and gentle rocking motion invites kids and families of all ages and abilities to participate in the fun. 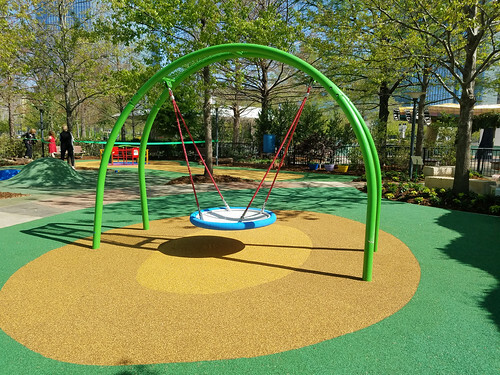 ​The Arch Swing, pictured above, is a fun and accessible way to add swinging motion to your playground. The wide seating area accommodates up to five children and is constructed of durable steel with a soft rubber bumper. Children with Sensory Processing Disorder, or similar sensory issues, can lay across the center section and enjoy the calming to-and-fro motion. Children can also sit around the perimeter of the seat and enjoy swinging together. Front row left side, Jan Brady, Janet Esser, Lonnie Austin, right side, Sylvia Bartemy, Shirley Pigg. Back row: Dave Bartemy, Dan Pigg, Virginia Treadway, Maureen Heffernan, Roy Taylor, Bill Reisman, Gary Tarkington. The Pioneers have a long history of community service. Originally organized in 1911 with Alexander Graham Bell as its first member, the Pioneers are a national organization of volunteers who have donated their time, energy and talents to create and provide services, facilities, and innovative contributions for special needs of their respective communities. With the motto, “United we serve,” the Pioneers remain the world’s largest single industry volunteer organization. The Thunderbird Pioneers is a nonprofit charitable organization that was organized in 1978 as the Oklahoma City Telephone Pioneer Council. The name Thunderbird was adopted in 1995 when AT&T split up the Bell System, separating telephone companies from the manufacturing and supply side of the telephone business. During the 43 years of manufacturing in Oklahoma City, more than 25,000 people were employed and eligible to become Pioneers. They have used their time and resources for a broad range of projects from renovating apartments for homeless families, building handicap access ramps at residences, to sending packages to servicemen in the Middle East, producing hug-a-bears to sooth child victims of earthquakes in California, planting trees in parks and in areas devastated by tornadoes, and upgrading and donating computers to schools. On December 7, 2017, Pioneers presented Myriad Gardens Foundation with a check for $75,000 to purchase and install the playground equipment. The Foundation coordinated the installation and operation of this new feature for the Children’s Garden.